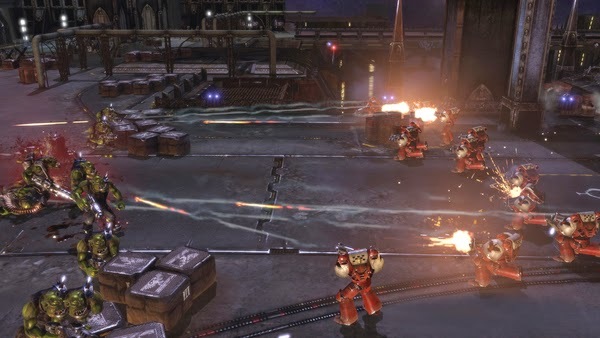 I've never been a huge fan of the Warhammer 40k universe, but I'm always up for a good strategy game. That's why I picked this one up. I don't know why I've waited to play it, but that's why it's called a backlog. Games are just laying there in wait. I was ready for a cool strategy game but I only found an ok one. It seems like this is built on the Company of Heroes engine. Company of Heroes was a World War II RTS that had ideas like suppression and firing arcs. This has those exact same ideas, but in the Warhammer 40k universe. Playing this RTS just served to remind me how good Blizzard is at making RTS games. I would much rather go play Starcraft 2, or even Warcraft 3, than play more of Dawn of War II. It just doesn't hold up. I played Saints Row 3 for awhile and enjoyed it. I never beat the game or felt truly drawn into the world, but it was a fun game to mess around in for an hour or two at a time. Saints Row IV is better. It's still a ton of fun to play around in, but it takes itself even less seriously. And I love the premise for the game, being trapped in a Matrix style simulation. It takes what I liked about Saints Row 3 and cranks it up even higher. I was genuinely laughing out loud while playing the game. I've tried over 45 games in my backlog at this point and Saints Row IV is the second one to actually engage me enough to lose track of time while playing. I intended to play for 30 to 45 minutes like I have been doing for most games I'm trying, but I played for well over an hour before I even thought to look at the time. Saints Row IV is going in my favorites list and it's easy for me to recommend it to you. This game reminds me of Diner Dash. It's fairly simple game design, but that's not a bad thing. You're managing the chaos of a restaurant and trying to keep up with customer demand. Cook, Serve, Delicious gets crazy once a lunch rush or dinner rush hits. It's fun in it's own way. You get to slowly improve the quality of your restaurant and buy new food and equipment. The progression mechanic is pretty cool in that way. I don't see myself spending a lot of time with this game, but I know it will really appeal to some people.